KENNEDY SPACE CENTER, FL--The Endeavour astronauts tested the shuttle's re-entry systems overnight Monday and began packing up for landing early Wednesday to close out the orbiter's 25th and final voyage. "After Endeavour comes to a stop on the runway, hopefully in Florida, it'll head off to a museum," commander Mark Kelly told CBS News in an orbital interview. "It's certainly bittersweet. The space shuttle's been the workhorse of the U.S. space program for better than 30 years now, so it'll be sad to see it retired. But we are looking forward to new spacecraft and new destinations and we're all excited about the future." 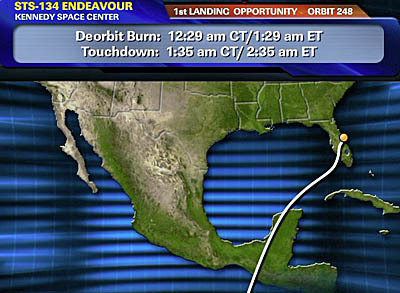 If all goes well, Kelly and pilot Gregory Johnson will fire Endeavour's braking rockets at 1:29 a.m. EDT (GMT-4) Wednesday, setting up a landing on runway 15 at the Kennedy Space Center around 2:35 a.m. to wrap up a 6.5-million-mile voyage spanning 16 days and 248 orbits. A second landing opportunity is available one orbit later, at 4:11 a.m. Forecasters with the Spaceflight Meteorology Group at the Johnson Space Center in Houston have been concerned about possibly high crosswinds for the past several days. But the latest forecast issued Monday evening called for "go" conditions for both Florida landing opportunities, with scattered clouds at 2,000 feet and winds out of 70 degrees at 8 knots with gusts to 12. For runway 15, the crosswinds are expected to be just below NASA's 12-knot limit for night landings. The forecast for NASA's backup landing site at Edwards Air Force Base, Calif., calls for good conditions with high-but-acceptable headwinds. But Endeavour has enough on-board supplies to stay in orbit three days past Wednesday and entry Flight Director Tony Ceccacci is not expected to call up Edwards for the first landing opportunity. If Endeavour does not get back to Florida on Wednesday, however, NASA likely will activate Edwards and bring the crew down Thursday on one coast or the other. "In general, we have what we call end-of-mission-plus-three capability, which is three full days of capability to extend beyond our planned end of mission day if we should need it," LeRoy Cain, chairman of NASA's Mission Management Team, said Monday afternoon. "Now, the plan that we talked about today is one whereby in all likelihood we'll be able to land (Wednesday), at least from a weather standpoint. "If we're not able to, then we would in all likelihood call up Edwards and try to land at end of mission plus one. It's been a long mission ... and so it's unlikely we would use anything beyond EOM plus one." Ceccacci plans to brief reporters on his landing strategy at 5 a.m. Tuesday. Monday night, Kelly, Johnson and fight engineer Roberto Vittori fired up one of Endeavour's hydraulic power units in a routine pre-entry test of the ship's fight control systems. They also test fired the shuttle's maneuvering thrusters before taking time out to practice landing procedures using a laptop flight simulator. Kelly, Johnson, Vittori and spacewalkers Michael Fincke, Gregory Chamitoff and Andrew Feustel planned to go to bed at 9:56 a.m. Tuesday and to get back up at 5:56 p.m. to begin landing preparations. Endeavour's flight has generated widespread interest because of the looming end of the shuttle program and because of the story of Arizona Rep. Gabrielle Giffords, Kelly's wife, who was gravely injured in an assassination attempt in January. Recovering in Houston,Giffords flew to Florida to watch Endeavour's launching and underwent successful surgery last week to replace part of her skull. Kelly told CBS News Monday that it had been difficult being away from his wife and that he looked forward to landing Wednesday. "Having her there for launch made it particularly important to me, to have her and Claudia and Claire, our two daughters there, it was really a special moment," he said. "After what happened to her Jan. 8, the fact that she was able to recover to the point to walk on the airplane, walk off, make the trip to Florida twice, it was really special. "Being away from here, to be honest, it's difficult. Fortunately, there's a phone on the space station, there's email, we can communicate and I'm looking forward to getting back there tomorrow." With Endeavour's return to Earth, NASA's focus will shift to preparing the shuttle Atlantis for launch July 8 on the program's 135th and final mission. A few hours before Endeavour begins its descent, engineers at the Kennedy Space Center plan to begin hauling Atlantis to launch pad 39A to ready the ship for its final blastoff.